Have you encountered any colorful mushrooms lately? After rainfall, mushrooms readily emerge and expand, just like a sponge. Look for a variety of shapes—toadstools, shelves, buttons, trumpets, balls, or slime. A mushroom is the visible part of a fungus. Mushrooms comprise the “fruiting body” of the fungus, producing spores for reproduction. Have you looked underneath a mushroom cap? Many have gills, which increase the spore-bearing surface, such as the deadly Amanitas. Other species produce their spores in elongated tubes like the Boletes, while the toothed fungi grow tooth-like spines extending down from the top, such as the white Shelving Tooth. Gravity draws the spores out when they are ready, releasing them into the wind to germinate on other moist surfaces. About 90 percent of a fungus lives hidden from view—inside trees or logs, or underground. Fungi cells called hyphae look like tubular thread-like structures that grow from their tips. Hyphae form large branching networks called mycelium. A cubic inch of topsoil contains enough mycelium to stretch a mile if placed end-to-end. Similar to animals, fungi feed on organic matter, store food as glycogen instead of starch like plants, and lack chlorophyll. Unlike animals that first ingest then digest their food, fungi secrete digestive enzymes into the environment before ingesting nutrients from organic matter. Saprophytic fungi, such as Birch Polypore and Turkey Tail, feed on dead organic matter and cause wood decay. Saprophytic fungi recycle about 85 percent of the carbon from organic matter, with bacteria and animal decomposers responsible for the other 15 percent. Mutualistic fungi called mycorrhizae engage in a beneficial relationship with tree roots. Mycorrhizae form a dense layer around small roots, helping them absorb water and nutrients, while also protecting them from pathogenic fungi or nematodes. Mycorrhizae receive some of the plant’s sugars, used for growth. Look on the forest floor for Giant Puffball or Fly Agaric. Pathogenic fungi feed on living organisms. Some species destroy wood, causing “brown rot” or “white rot” inside trees. 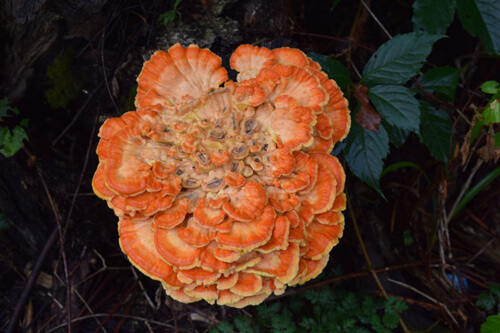 Examples include Honey Mushroom in tree holes and Sulphur Shelf growing on stumps. Unicellular pathogenic fungi cause some diseases in humans, such as athlete’s foot. Slugs, snails, box turtles, insect larvae, and squirrels eat mushrooms. Your hunt can be challenging, depending on who finds them first. Spores come in many colors and help in accurate mushroom identification. Here’s an easy way to see spores: Cut off the mushroom cap, place it on a piece of paper, and cover it with a glass or plastic cup to prevent disturbance. After 24 hours, remove the cup and cap to find a spore print from dark or brown-spored mushrooms. If there isn’t a spore point, try again with a dark piece of paper in order to catch pink or light-colored spores. Then search a fungi field guide for further characteristics. Bracket fungi grow like semicircular shelves from the sides of trees. They last for weeks, months, or through the winter. Violet polypore shows off its dark violet edge in contrast with its white body, while the Turkey Tail displays waves of tan, rust, and brown. 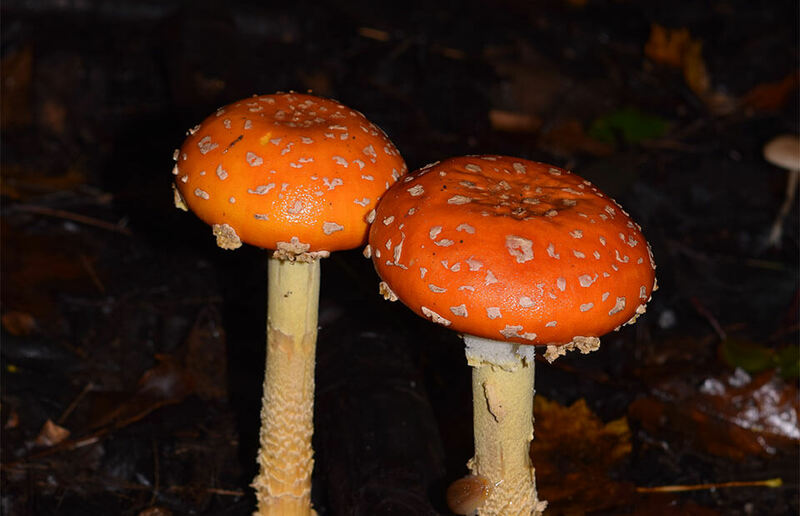 Typical toadstools, such as the Fly Agaric and Destroying Angel, sprout from an underground cup, have a ring on the stalk, and are very poisonous. Trumpet-shaped, yellow-to-orange Chanterelles show thick, forked gills that curve down the stem. The Horn of Plenty is smoky-grey with a wavy in-rolled margin. Wax Caps show off bright orange, yellow, or red button tops. Blue-staining Bolete grows under hardwoods and has white thick flesh that stains rapidly to brilliant blue when cut. Lemon Drops fill a log with small, yellow saucer-shaped balls.